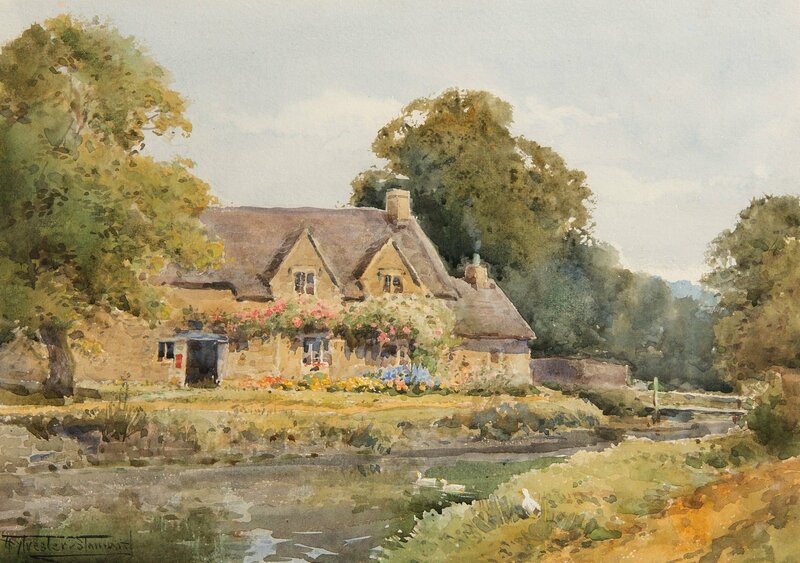 This charming watercolour of the post office in the idyllic Cotswold village of Lower Slaughter, near Cheltenham, is by the eminent country painter Henry Stannard. The building is depicted from the opposite side of the river that runs through the village. The surrounding trees are in full leaf, and the Cotswold-stone post office is covered with the pink flowers of a climbing rose. Thankfully, this scene in real life is still largely the same today as it is shown here, almost a century earlier. The village remains unchanged, and is protected under planning laws. However, Stannard seems to have perfectly captured the nostalgia and sleepiness of the village on a summer’s day. Henry John Sylvester Stannard was an acclaimed British landscape painter, who worked primarily in watercolour, and whose patrons included the British Royal Family and other members of the aristocracy. Stannard was born in the village of Flitwick, near Bedford, in 1870. His father was Henry Stannard Senior, who was also a well-known sporting painter. Their family were artists in Bedfordshire for several generations. Stannard went to school at Bedford Modern, and then trained as a painter at the National Art Training School in South Kensington. Once he had graduated from art school, Stannard immediately began his career and his work was met with great success. 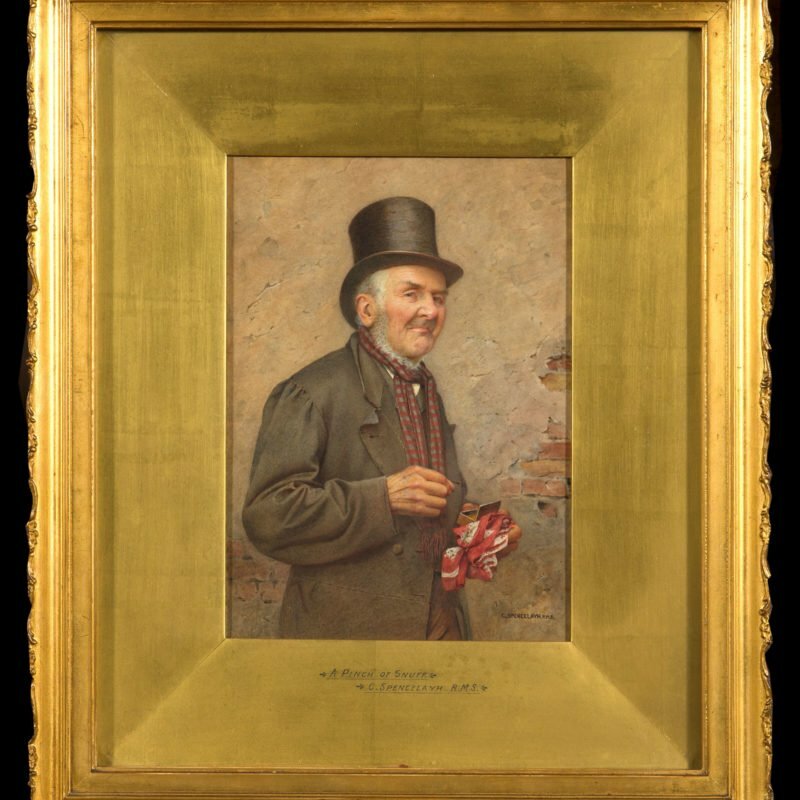 His work was soon exhibited at the Royal Academy, the Royal Institute of Painters in Watercolours, the New Gallery, The Royal Society of British Artists and the Royal Cambrian Academy of Art. In 1896, he was elected as a member of the Royal British Academy. Inspired by his rural surroundings, Stannard typically made pastoral scenes of the idyllic British countryside, which is how he made his name, and helped him to be so popular commercially. 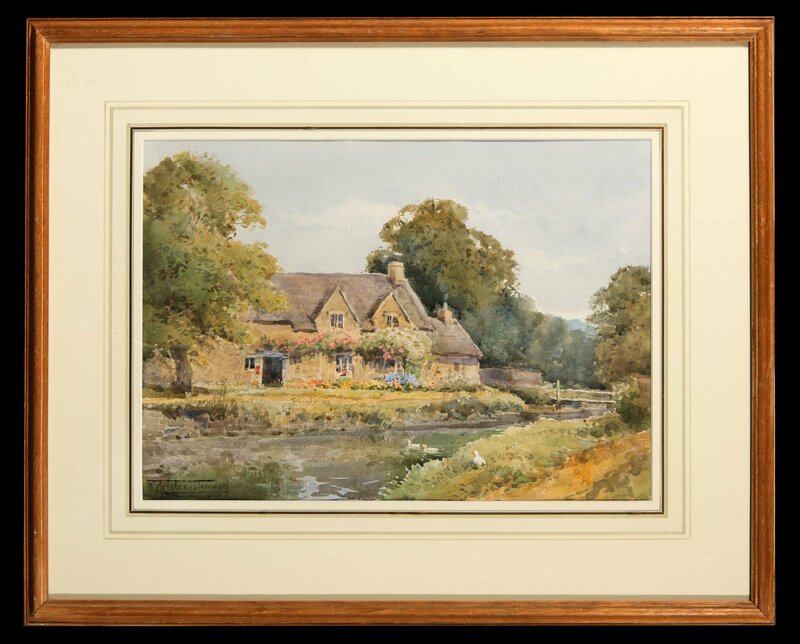 He is particularly recognised for depictions of chocolate-box cottages with pretty gardens. Several artists at the time imitated his subject matter and style, yet none achieved the same sensitivity and beauty in their paintings as he did. Stannard enjoyed great success throughout his life, most notably when, in 1906, Queen Alexandra commissioned a number of pictures of Sandringham including Her Majesty’s ‘Woods’ and ‘Wild Garden’. In 1922, Stannard and his daughter, also a painter, held an exhibition at the Brook Street Galleries in London, where Queen Mary bought several of his drawings. Then, in 1934, the Governors of Guernsey commissioned him to paint a view of St Fermain’s Bay and the harbour, a painting that would subsequently be presented to the Prince of Wales. The Prince of Siam also commissioned a painting of the gardens at Virginia Water. These Royal commissions helped to propel Stannard into a worldwide career. Stannard died at his home near Bedford in 1951, and his oeuvre has remained popular in exhibitions and at auction.